We have a special place in our hearts for the fine folks at Gibson’s acoustic plant in Bozeman, Montana. There, craftsmanship and passion come together to create some of the most inspiring instruments we have ever had the privilege of playing. Character, vibe and an indescribable sonic magic can be found in spades within these incredible instruments. From the classic J-45 all the way up to the SJ-200, these acoustics are sure to inspire you to reach new heights in your playing. The staff at Wildwood Guitars is dedicated to helping you discover the magic of a Gibson’s acoustic instruments. We know we can find you one that speaks to your soul! What stories will you tell? What magic will you uncover? We hope to answer those questions and more with our incredible selection, knowledge and passion. It’s with great pride that Wildwood Guitars presents to you, our Gibson Acoustic inventory. The year 2019 marks Gibson Montana’s 30th Anniversary, and to celebrate, they’re giving US the presents! Here, you’ll find everything from super-limited treasures to iconic mainstays to new groundbreaking designs. 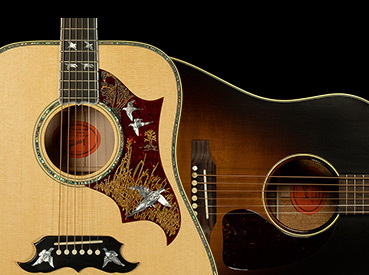 We invite you to browse our selection of Gibson’s 2019 acoustics and bask in their myriad sonic and aesthetic delights. We’re sure you’ll find a guitar that will inspire you for a lifetime on all your acoustic adventures!